A $5 shift’s end grab-bag from Voodoo Donuts newish location in downtown Eugene, conveniently near the KLCC studio. I’ve never been much of a doughnut girl. Sure, I’ll indulge in an occasional airy Krispy Kreme or a coconut-frosted from the 24-hour Donut Pub when I lived in Chelsea (as featured in Louis CK), but they generally don’t seem worth the calories. Not my go-to vice. However, Dan (and his dad) love a good donut, so I’m wont to buy them to be a good wife. 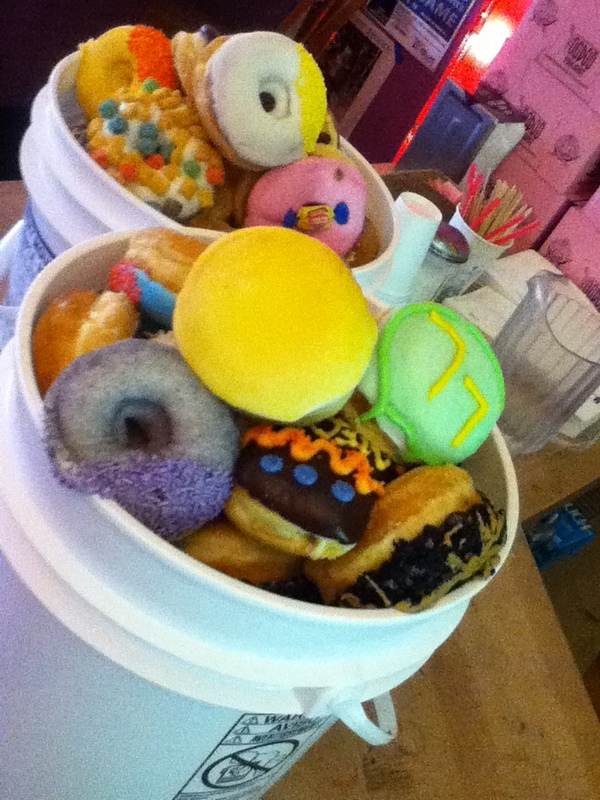 While working at KLCC, I once came home with a nasty $5 bucket from Voodoo Donuts. That’s how they clear out the inventory at the end of each shift. It was chock full of Capt’n Crunch, Double-Bubble Gum and rainbow sprinkle-clad donuts, way too syrupy-sweet for my palate. Dan gifted most of them to the OSU economics student lounge, where they were appreciated. The Voodoo thing is more about shock-value than flavor. We did enjoy their Neapolitan (chocolate cake with vanilla frosting, tangy strawberry sugar and marshmellows in whole) and the huge Memphis Mafia (glazed banana fritter topped with peanut butter, nuts and chocolate). Voodoo can not be judged by its mediocre glazed donut. And just say no to Voodoo’s gimmicky Bacon Maple Ale, brewed by Rogue. It’s expensive and supposedly nasty. OId-school Tony’s Donuts in the other Portland (Maine) is a favorite of my father-in-law’s. 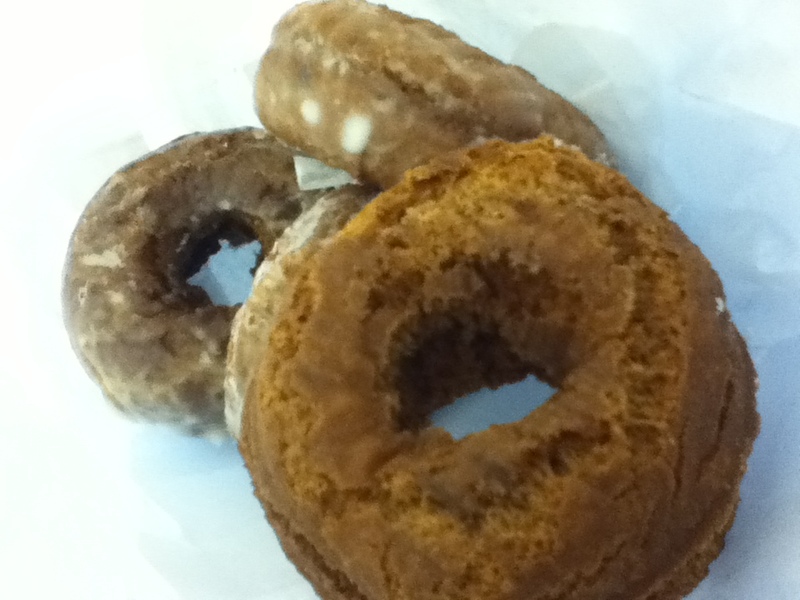 Tony’s is known for its molasses donuts, both cake and glazed. Delicious with coffee! So far, Maine donuts are more my style, with old-fashioned, uncomplicated flavors. 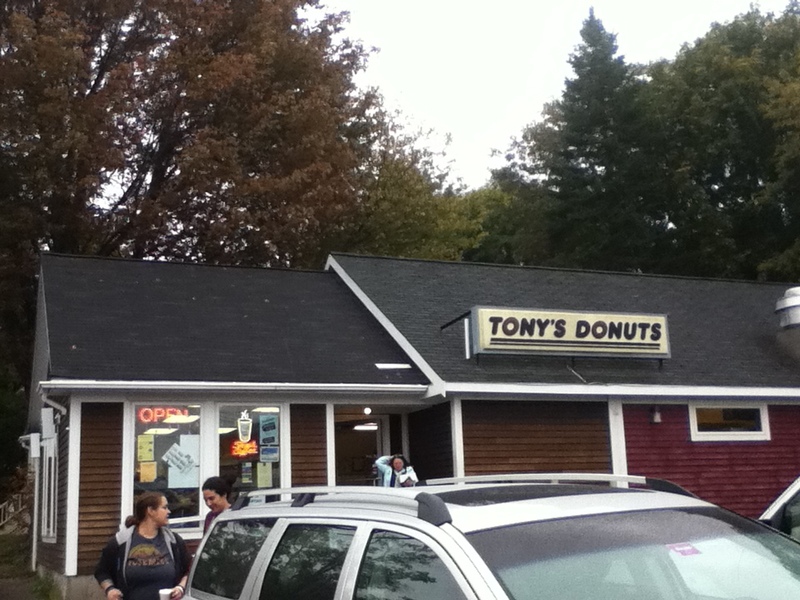 I hit up landmark Tony’s Donuts on the drive back from the Portland airport last week. Tony’s kept my father-in-law warm and happy when his Visicu work took him to Maine Med. The sought-after glazed molasses is my order at Tony’s. Nothing says New England like molasses. They put it in their baked beans, their cornmeal-studded Anadama bread and brew it into dark rum. Tony’s Donuts in Portland is famous for their molasses donuts, both cake and glazed. They’re like a cakey, fried, spiced molasses cookie. Now, it’s rare that I’ll have two donuts in one week. This is not a habit I’m looking to acquire. But Dan came home from a downtown eye appointment today with two donuts from Frosty’s, whose reputation seems to exceed Tony’s, at least here in Brunswick. The blueberry one tasted artificial, but the glazed buttermilk one, yes buttermilk!, was a revelation. So light and creamy and not at all cloying. Almost like the famous Mrs. Yoder’s sourdough ones at the Richmond Farmer’s Market. These buttermilk donuts won’t help in the ongoing quest to lose the baby weight (sure, blame it on the baby even though you had those pounds to lose before he was even conceived). I was already worried about the freshman fifteen with the stellar dining hall food, which we do partake of here. So sorry we did not know about these doughnuts when were there last week! Now my mouth is watering for a really good doughnut. If only I knew where to satisfy this itch….. Sorry we didn’t think of this in time! Check out The Donut Pub sometime in NYC’s Chelsea. I’m partial to their frosted coconut one.